Brand new pool, beautiful architecture, brilliant staff and blissful rooms await you at Chiang Mai’s newest budget boutique hotel. The White Boutique Hotel & Spa is the perfect balance of luxury without breaking the bank. This is not a sponsored post. We received no payment for our stay at The White Boutique Hotel, we simply loved it so much we wanted to share our experiences with you! Alex and I were just beginning our 3-week trip around Thailand. Our trip would start in Chiang Mai we would then be off to Pai, Chiang Rai, Ao Nang, Ayutthaya and end in Bangkok. As we were starting in Chiang Mai we wanted our first accommodation to be perfect. After spending a few hours on booking.com and Airbnb I finally found The White Boutique Hotel & Spa. As I showed it to Alex he also agreed it looked amazing. Our only concern was that as it was so new, there were not many reviews. Yet the reviews that were there were all very positive. After some deliberation we decided to book three nights at The White Boutique Hotel & Spa in Chiang Mai. It was a fantastic decision as we had such a great stay there! After travelling for 27 hours we got a grab taxi from the Chiang Mai Airport to the White Boutique Hotel and hoped a nice new hotel was waiting for us at the end of our long journey. Our taxi driver was very chatty, he smiled the whole way to the hotel. It took less than 20 minutes to arrive at the White Boutique Hotel. It was dark as we arrived, but we received a very warm welcome. The pool was illuminated, and gentle spa music could be heard. The staff greeted us with huge smiles and took us through to reception. This really was the land of smiles! We were given refreshing fruit juices and damp towels whilst we checked in which was a nice touch. After signing the documents, we were given a voucher to use the spa facilities then we were taken to our room. As it was low season, we were given a double room rather than the twin room which I had reluctantly booked. I thought we could put up with the twin beds as the hotel and location just looked too good! Now our room had been changed I knew our stay would be perfect! Security is taken very seriously at The White Boutique Hotel & Spa. We were both given white key cards which were required to use the lift as well as access our rooms. The gentleman who took us to our room explained how the lifts worked. Each room also comes with a safe for those who would like to lock their valuables away. The White boutique has two types of rooms. Both are deluxe rooms which provide a total of 27 square metres of living space. This is amble size for couples like us. We loved the interior. The rooms are very beautiful. According to the website the rooms have a “minimalist Lanna-style décor’. I loved the decorative head board. Of course, all rooms have free Wi-Fi and air conditioning. More in-room amenities included a flat screen TV and tea and coffee-making facilities. We appreciated the coffee when we had a very early start to the chase the sunrise at Wat Doi Suthep. All of the beautiful rooms have an equally beautiful bathroom with a great shower. The sink looks like a delicate piece of chinaware. There were plenty of towels, slippers and even bathrobes. The complimentary toiletries which were made locally which was a nice touch. Those with long hair will also appreciate the hairdryer by the door. The view from the room was nice. We could see the mountains in the distance. Yet back out on the balcony was a much more exciting view: the White Boutique Hotel’s pool! We spent many hours in the White Boutique Hotel’s swimming pool. After a morning of site seeing it was lovely to spend the afternoon at the hotel’s pool. Rarely busy in the early afternoon we enjoyed lying on the wooden loungers and lazing around the pool. There was no overpowering smell of chlorine as the pool was chlorinated with salt. The hotel argues that it is the healthiest and efficient way of pool water treatment. It was certainly nice to swim in water that was not full of harsh chemicals. As we swam up and down this salt pool we could hear calming music coming from the spa. Occasionally, the scent of essential oils would drift across the water. All it all, it was a very, very relaxing experience chilling by the White Boutique Hotel’s pool. The pool is open from 8am until 7pm yet the staff do not enforce these rules stringently and if you fancy an early swim or an evening dip as long as you are quiet, they do not mind. In the day the pool is offered to guests at other hotels for a small fee. So if you happen to be staying at a hostel nearby you can still check out this wonderful pool. We loved the design of the building. It was, as the name suggests, painted white. There were so many lovely touches such as the lanna-style balconies and the statues by the door. The location of the White Boutique Hotel is excellent. The hotel is just 5km away from the Chiang Mai airport. East gate, one of the most popular gates in the old town is under 15mins away on foot or even less by tuk tuk or grab. Of course, the Hotel could be inside the old city wall but you would pay much more for your stay if it was inside the old town. By just staying outside you have a luxurious room and your own private pool for a very reasonable price. How Vegan-friendly is the White Boutique Hotel? The only negative point I can say about the White Boutique Hotel is that the breakfast was not vegan friendly. The serve a European style breakfast of eggs, cheese and meats. Yet when you are staying in one of the vegan capitals of the world, we were happy to explore local vegan restaurants. For a particularly delicious breakfast we would thoroughly recommend Goodsouls for their pancakes and tofu scramble. A grab taxi takes just 5-10mins from The White Boutique Hotel to Goodsouls. The staff at the White Boutique Hotel were wonderful. They could not help us enough when we needed help booking onward transport to Pai and booking a Thai cooking class. Warm smiles and translation were provided without hesitation which was a very different experience to the rude staff at our hotel in Ayutthaya! We asked to book another night and they extended our stay happily and with ease. Thank you to all at the White Boutique Hotel who made our stay absolutely wonderful. We would thoroughly recommend the White Boutique Hotel! 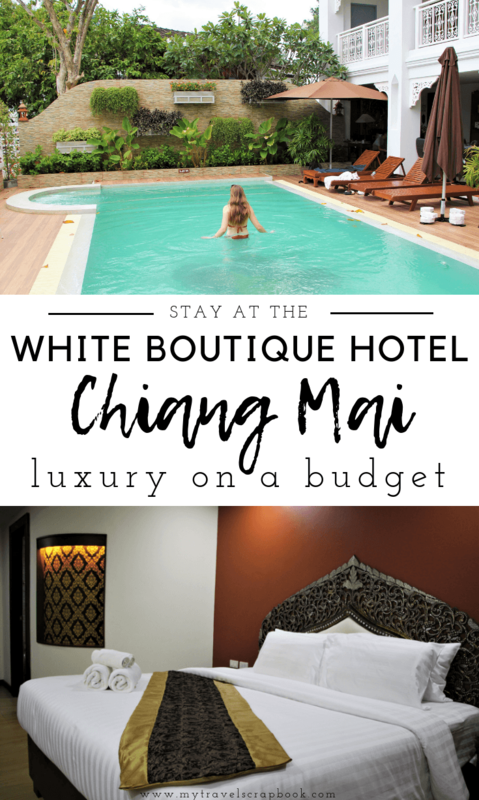 We would thoroughly recommend staying at the White Boutique Hotel when you are in Chiang Mai. The bedrooms, the pool, the location and the staff make this an excellent chance for a little slice of luxury at a very reasonable price. What are your thoughts? Would you like to stay at the White Boutique Hotel?